Not liking any of the 1932 Ford frames available in kits at that time, Larry scratchbuilt his own, then turned it over to the Replicas and Miniatures Company of Maryland for reporoduction in resin. 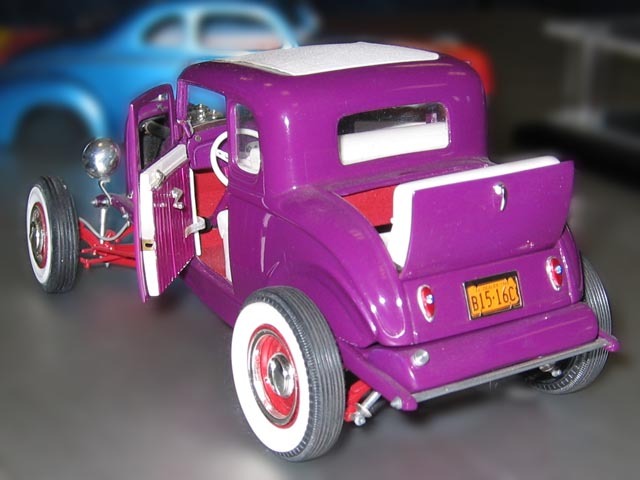 After making many modifications to an AMT 1932 Ford 3-window coupe body to give it accurate proportions, Larry opened and authentically hinged the doors and rumble seat. The hinges he made are scale reproductions of, and work in the same manner as the hinges on an actual 1932 Ford 3-window coupe. The purple paint that covers most of the model is R&M lacquer that was custom mixed to Duncan's specifications so that it would perfectly match Duncan's car.